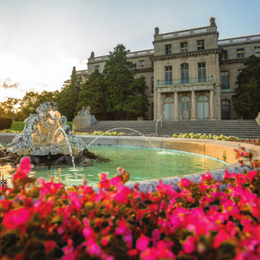 As soon as you step foot on this 159-acre campus in West Long Branch, N.J., it’s easy to see why Monmouth University has been named one of Buzzfeed’s “25 Most Beautiful College Campuses in the World,” and why both U.S. News & World Report and The Princeton Review recognize it as one of the “Best Colleges” in the country. Nestled along the coastline and just one hour from New York City and Philadelphia, you’ll find a warm, friendly atmosphere and experience the historic architecture mingled among new academic buildings and residence halls that students are drawn to. From top facilities to the engaged faculty, it’s evident that Monmouth University takes pride in preparing students to succeed in life. At Monmouth, transformative learning does not only take place in a lecture hall but through a variety of ways—some experiential, technological, collaborative and innovative. The University is committed to learning experiences that are high-impact, immersive and extend beyond the classroom. Research opportunities are a transformative way for qualified students in any major to work one on one with faculty on a wide variety of topics, and to nurture both the student’s intellectual and career passions. Employers want to see how job candidates think and function, analytically and creatively. “Our students are gaining experience that serves as the perfect bridge from college to career—they make a real impression,” says Dr. Kathryn Kloby, vice provost for transformative learning. Arturo Romua ’13 attended Monmouth for its marine and environmental biology and policy major. Since then, he has taken what he learned in the classroom and from research projects, to benefit a larger learning experience. Monmouth University also has established networks of professionals for each of its schools, who serve in an advisory capacity. These councils help to advance distinctive curricula and degree programs and are an essential part of the fabric of the University. Council members also support Monmouth’s students by talking to them about dressing for success, advising on résumé writing and appropriate social media skills, and instilling the value of teamwork. At Monmouth University, students gain hands-on experience working in and around New York City and Philadelphia. In fact, 78 percent of Monmouth students have completed a practicum, internship, co-op or similar “real world” experience by their senior year—that’s more than 30 percentage points above the national average at comparable institutions. For Monmouth alumni Thomas Beaufort ’15 of Philadelphia and senior Amy Rosenzweig ’17 of Springfield, Pa., internships were key. Thomas turned his internship into a full-time position and is currently an operations credit risk analyst for J.P. Morgan. Amy is finishing her international business degree at Monmouth University’s Leon Hess Business School and secured an internship with DLL, an international finance firm. Both credit their internships in helping them gain experience and open the door to great job opportunities. Through Monmouth’s alternative break program students can use spring and winter break time to give back—in the next town or across the globe. From helping communities in Sea Bright, N.J., recover from Superstorm Sandy to building a new school in Guatemala, Monmouth provides unique opportunities for students to help others while learning more about the world around them. From first-year advising to career services and experiential education, Monmouth helps students plan ahead from the very first day. Students, in turn, gain valuable hands-on experience that has led more than 48,000 alumni to successful careers throughout the country and around the world.